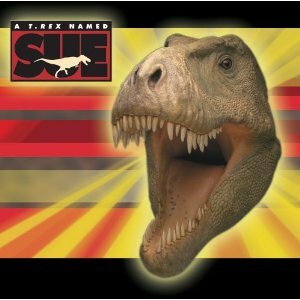 We spent some time this evening, listening to Music Little People's A T-Rex Named Sue, after seeing it mentioned by Christy over at Superheroes and Princesses. It retells the story of Sue Hendrickson's find of the most complete T-Rex skeleton yet, interspersing the story with silly little songs. The styles of music vary widely through the CD, so if you don't like one song, you might like the next. If you're curious, you can listen to a sampling of the audio at Amazon.com. Even though we live in "the treasure state", where the effects of gold fever are well known, the children have been having a hard time understanding the greed of the bone wars during the mid-nineteenth century, or how the ownership of a modern fossil find, like Sue, could end up needing to be settled with a lawsuit. I thought I'd give them a taste of fossil fever - literally - you know, with a cookie. I started by mixing up an entire batch of sugar cookie dough (click here, for the recipe). Normally for a snack for the six children, I only use a half batch, so this time they were getting extra. I divided the dough in half, and added two tablespoons of baker's cocoa to one half, which I used to make my "fossilized bones". I followed the same basic bone pattern we had used a while back, when we made our salt dough fossils, except I reversed the colors, because we've learned through our recent reading, that the fossilized bones are darker than the surrounding sandstone. That's part of what makes them possible to spot. I baked the chocolate pieces for 12 minutes at 350 degrees Fahrenheit, and then removed them from the oven, two minutes earlier than normal. While they cooled, I patted out the remaining vanilla dough, into a flat oval, maybe a quarter inch thick, and baked that for 12 minutes, too. After removing it from the oven, I pressed the almost baked chocolate pieces into the almost baked oval, reduced the oven temperature to 300 degrees Fahrenheit (because the center of the oval was still pretty doughy, but the edges were nearly done), and popped the whole thing back into the oven for about 7 minutes, until the vanilla dough was beginning to brown, and the center seemed firm. When I served it to the children, for their snack, I explained it was more cookie than they normally get, so there was plenty - just like there were plenty of fossils for all the paleontologists during the bone wars, and even now. No one needed to loose their head. Then, I stood back, and let the bone, or rather cookie, wars begin. You always have the BEST ideas! This one is SWEET ;). I know my little ones are going to love it. Thanks for the inspiration! This is such a cute cookie idea. Thank you for sharing it. My kids love the book & enjoy audio books, so we'll give it a listen, too. Great lesson on how greed drives the human being! Again, another great idea. Thanks for sharing.